Shopping for Despicable Me / Minions Wall Murals? 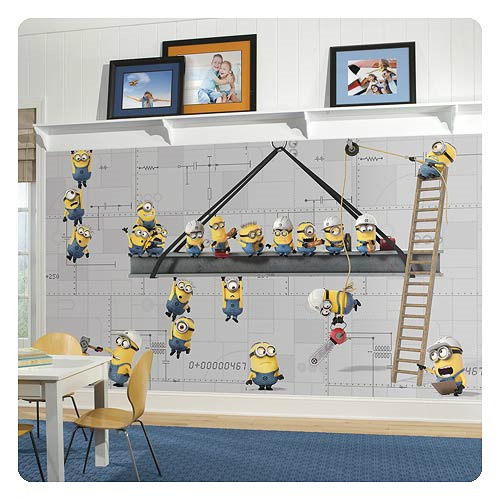 Add fun and humor to your wall with this Minions at Work XL chair rail pre-pasted mural by RoomMates! Featuring everyone's favorite Minion brothers, this wall mural is guaranteed to get the party started. Simply activate each panel with water and apply them side-by-side on a smooth, flat surface. Easy to remove and reposition, create a Minion world in your room today! Decal measures 126-inches wide by 72-inches tall. Ages 14 and up. Please note: This product is NOT reusable.